The other day when I detailed the budgeting approach I use that eliminates a lot of mental stress, retires debts and builds assets, the 70/20/10 method, as I like to call it, I went into some detail on the "10" part, which is the investing portion. The 10% that goes into investments I described as being a source of passive income to help feed the overall strategy. The mainstay of the portfolio I've built is made up of individual dividend paying stocks, and I recommended a particular broker for utilizing the plan in that way. I realize that not everyone is comfortable picking and investing in individual stocks, however, so this morning I wanted to mention another low cost, easy to use option for creating that part of the plan, or just for easy investing in general if that's all you're wanting to do. This is another service that I've been using for a couple of years now. In short, Acorns is one of those "robo-advisors" you may have heard of, an investing firm that offers ready made, diversified portfolios that automatically allocate your cash deposits among the several components. They also automatically reinvest dividends and rebalance the portfolio when needed, too, all without you having to lift a finger. That's a beautiful twelve month graph, isn't it? And that's what this system has done for me, with my only involvement being an occasional peek to see how it's doing and adding a little cash from time to time. As you can see from the pic, this is an image I captured from the screen of my smart phone. Acorns has a web interface, but its primary interface is through the app. This makes it easy to access and use anywhere that you happen to be. An additional feature of this platform is that you can link credit and debit cards to it and invest through "round-ups" of your day-to-day spending. What this feature does is monitor your purchases on linked cards, round up the amount to the nearest dollar, and when the round-ups equal or exceed $5, it will "sweep" that amount from your linked checking account into your portfolio, slowly feeding your investments over time based on your spending (you don't have to use this feature though, you can just add specified amount of cash to your portfolio through the app at your discretion instead). There is a fee for this service, but for everything you get I find that it's very reasonable. On portfolio balances below $5000, it's $1 per month. 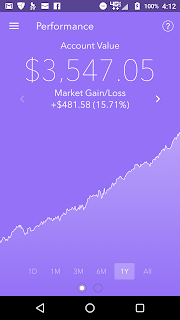 When your portfolio grows past that amount, it switches to .25% annually, charged monthly and computed daily. For that you get low dollar amount investing in a diversified portfolio, dividend reinvestment, and automatic reallocation. One of these accounts can be opened with just $5. If you approach one of the "big firms" with $5 and ask for all of these services, not only would you not get access to them at this kind of price, they wouldn't let you in the door in the first place. 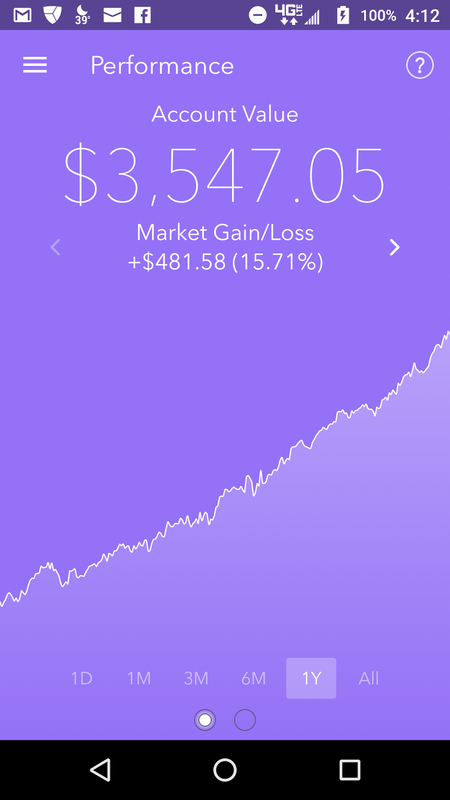 So check Acorns out if you want to invest but individual stocks are not your cup of tea. As you can see by the pic above, I've not done badly with it at all. It's not quite the passive income stream kind of investment I described in my 70/20/10 post the other day, but if that's not your primary concern, or if you prefer to withdraw a set percentage of your investments per year for inclusion in your budget, it can definitely work for you.